Gary R Adnum I January 1983 was Manager Warialda, had a brother Tony working in CBC. Tony O Adnum 1 January 1983 was Reserve Staff Manager. Cyril Avery was Manager Grenfell (followed Alan Plowman) in the 1950s, Tumbarumba, Kingston ACT, Nowra from where he retired. Mrs Avery died whilst he was at Kingston. Leigh Avery and Miss Avery, both in the 1970s. Ken retired to the Central Coast. After a short illness Ken died on 8/11/2011. Graham Owens wrote: Patty Bain joined CBC Gilgandra in January 1956, about 2 weeks before I joined at the same branch. Her father was then Principal of the Gilgandra Primary School, so perhaps Ken joined at Gilgandra too. 1960 married Ronald Emmett Foran. Kay, Bev and Noni were sisters working the the Bank. Kaye joined at Royal Exchange under Les Cornell who was Accountant there. Later Kaye worked at Burwood and Stock Exchange where she was Ledger Supervisor then George & Hunter Streets, Haberfield, Premises, Personnel, then Regional Manager's Clerk Relief then Money Market. Peter was an Audit Clerk and later a Credit Analyst working in Lending NSW. Peter, Senior Credit Analyst NSW Lending was appointed Assistamt Manager Parramatta. Then he purchased a Newsagency in the McGraths Hill vicinity. Peter passed away about 2005 following lung illness. Tony (AA Barlow) was a brother to Peter. Tony was Manager at branches including Oaklands and Berry then Bowral from June 1985. In 2006 Tony was living in Queensland and attends retired officers functions in Brisbane. Miss Pam Barry was Ledger Supervisor Tamworth 400 Peel Street in 1959. Philip John Barry, brother of Pam joined the bank in the 1960s and later worked in Head Office. Phil, late of Balgowlah, died on 9th February 2008. W A Baxter (of WA Baxter & Co Lawyers occupiers of CBCofS building in Gunnedah) was probably brother of RA (Bob) Baxter and father of Michael Baxter. Miss Baxter married to Mr Packer is probably daughter of Michael Baxter Collated by John Beer. 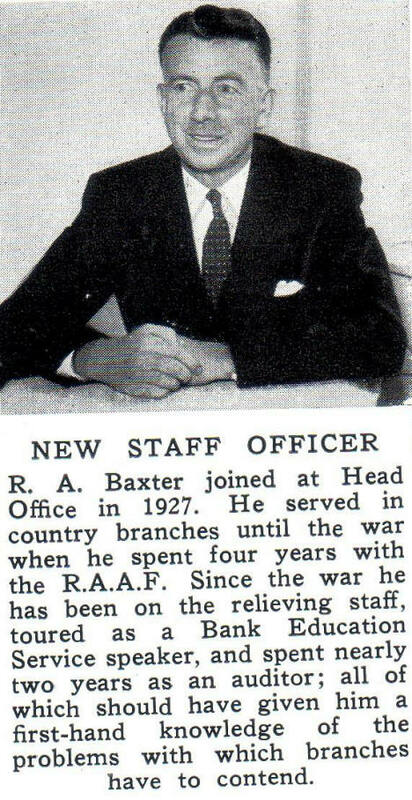 1957 new Staff Officer (from 1958 January Current Accounts Pg 36). John Beer's uncle, Fred Carpenter joined at Head Office in 1925. then Coonamble & 27 NSW country branches then Petersham 1949 & Accountant Kingsford in 1952. In 1955 Fred returned to HO including in charge of Safe Custody 343 George Street and Fred retired from Bonds & Debentures 8 July 1971. John & Doug’s grandmother was Maggie Woods whose sister’s granddaughter Marjory Gregory married Jim Harborne on 3 February 1962. Jim was Manager Lidcombe, Griffith, Bega, and Richmond. Jim and Marje have retired to Taralga from where Jim is still entering chooks and cattle in agricultural shows where prizes continue to be received, continuing in the tradition of Marje’s father Bill Gregory (Keera Station, Bingara) who was a successful presenter of cattle in agricultural shows. relieved at branches in NW to Brewarrina & down New England Highway to Belmont. Then to 2IC Gulargambone, Temora, Baulkham Hills, Internal Audit Clerk, Relieving Manager, Manager Darwin, retiring as a Manager Internal Audit in 1992. Doug Beer, John's brother, worked at Uralla branch. John Beer advised: "The Railway operations at Werris Creek were unique & one significant part of the economy & employment for the town. John B worked at Werris Creek more than once & would wait at Werris Creek Rail Junction from midnight to 3am for the train from the south east to Narrabri when travelling from Tamworth Railway Station to relieve at branches north/north west of Werris Creek." Noel was Audit Clerk then Auditor and retired as a Manager Internal Audit about 1985 to a home he built in Queensland then to Noosa Heads. Ray was Noel's brother. His son Rod told us that when he was of school age, he and his father were at Charleville, Stanthorpe, Innisfail, Woodenbong ( about 1958 when there was no electricity available to be connected to CBC Woodenbong premises so Ray had to provide his own kerosene refrigerator), Cunnamulla (where he was the youngest manager at the time, being 39). Ray then was at Pittsworth, Stanthorpe again, University of New England Armidale in the 1980s, Ipswich and then Brisbane on relief staff until his retirement. Ray was well known for the charity works he conducted over 30 years. He passed away in 2000. Rod (55), Ray's son, was himself in the bank from 20/3/72 until February 1975. He went from Queen & Creek Streets Brisbane to Alderley, and was No. 1 Teller at Burleigh Heads. After that he studied and then went to Arnotts Brisbane where he became Head Office Accountant and now works in Sydney for Multiplex internal audit. He rediscovered the CBC when he came across the website in 2007. Rick Bensley was Eric O Bensley's son at one time at Harden CBCofC (from John Beer). Rick Bensley was manager at Kiama when I was manager Milton in the early 1980s. Rick was a Vietnam conscript (from David JObson). Jon was Manager at branches including Rockingham WA. His daughter Helen was on Taree Branch staff and later was at CBC Health Society in Head Office. David and Greg both worked in the Bank, and both worked in Darwin branch, David on opening of the branch in 1971, and Greg in 1974/5. Joined Bank through Glenn Weiss at Candelo and was appointed to Pambula under John Thacker in about 1963. Retired ? from Hurstville in 1971 to have the first of our 3 children. Back to Staff/Personnel department after about 6 months, Did various jobs there including relieving Manager Personnel,Manager Personnel Staff Lending and looked after the Relieving staff plus other bits and pieces. Worked closely with Norm Hanlon and George Carman. 1982 Two branches split so looked after Byron Bay only (thank goodness). Byron Bay sub branch converted to a branch after which John was Manager Byron Bay branch with a new Manager appointed to Bangalow branch. 1984 Resigned and went in to own business. G.C. Bowman joined CBC in 1911 at Aberdeen branch. He spent 3.5 years with the forces in World War I. He became manager Kogarah in 1930, 1933 manager Petersham, 1938 manager Kingsford and retired from Kingsford in September 1958 (from Current Accounts January 1959 p51). 1974 July 2 passed away (from Current Accounts 1975 Jan Pg 59). John Beer states: "I knew G C Bowman when he moved to Cremorne after retirement.in the early 1960;s. He had lost a leg in the Great War but drove a manual gearbox car (there were no automatics) and was a good lawn bowler." Geoff C, Mr. Bowman's son, known as Cam, was also appointed Manager of Kogarah branch in 1971 (from Current Accounts July 1972). He had a brother who retired from Lindfield branch some time after this, according to John Beer. D B Bowman joined CBC in 1923 at Head Office. He retired from Canberra branch on 16 July 1967 to live at Palm Beach Qld. He had two daughters on Canberra staff. Joined CBC around 1941. Was Manager, Paddington in 1971. Lived at Wollstonecraft. Died 19/12/1973 aged 57. Evelyn Madge Boylan (nee Gilchrist) formerly of Blaxland, late of Rhodes was the wife of W.D. Boylan, died 18/4/2017 aged 94. Joined CBC. Col's first branch was Eugowra, thence to Baradine, took over from Frank Border as Manager Taree, handed over Taree to Peter Burms, Picton, Tamworth, Relieving Staff in December 1978. From Tamworth, Col purchased a retirement home at Pheasant's Nest (somewhere near Picton) from where he operated as a Relieving Manager. 2005 July died aged 85 years. He had been living at Port Macquarie at the time of his demise. Graham Foulcher was very sorry to read of the death of Col Bray. Whilst Graham was at Picton he saw a great deal of Col until he moved to the Port Macquarie area. His father (late Roy Bray) was Graham’s Dad’s (Roy Foulcher) first boss when Roy Foulcher first joined the Bank as a Junior in Head Office (Local Exchanges Dept. in those days. H.D. Brook joined CBC in 1933 at Ganmain. In the 1930s he was at Bribbaree, then Ungarie and The Rock. During World War II he spent 42 months in the Army. He was appointed Manager Walla Walla in 1958, was then on Audit Staff and Manager Gosford before being appointed Assistant Inspector in 1965. He was then Inspector (Divisional Manager), Chief Manager NSW and Bank representative on CBC Health Society. He retired 14th April 1977. He was also Vice President of CBC Sub-Branch of RSL. C. Roy Brown, born 1921, was Manager at branches including Werris Creek and Camden before working in Lending NSW and later Regional Manager. When at Camden Bill Green was Accountant. A customer used to refer to Mr Brown / Mr Green as Mr Black / Mr White. In WWII Roy was Manager of guns. There was an item in Current Accounts where Hanleys Removals had got an army item used as door stop mixed up between Roy's belongings and those of his son Bill where the army item used as a door stop ended up with Bill's items at Adaminaby / Candelo / Cooma. Roy's sons also worked in CBC until shortly after the merger:. Charles William (Bill) Brown was on relieving staff. Mr. Keith Burge was a branch Manager on NSW's South Coast. His son Ross Burge followed his father into CBC, being Accountant Griffith then Manager of branches including Barellan in the early 1970s. When Ross left the Bank he drove taxis in Newcastle. Ross was tragically killed instantly in a horrific motor accident. Stopped by a flagman at roadworks on New England Highway, a semi trailer rammed into his small car from behind and basically ran over the car, reducing its height to about 60cm. A sepia photo of John (Jack) Edwards Burgess taken in 1911/1912 is on this website under Comboyne branch was sent in by his grandson Terry (see below). The horse was his mode of transport at that time. CBC Circular No.557 dated 14/11/1911 advised, "Mr J E Burgess is appointed manager of Comboyne Branch." Terry Burgess sent in a sepia photo of Jack Burgess and his mode of transport (horse) taken at Comboyne 1911/1912. Terry believed Comboyne Branch was only open for about eleven months and would have closed by the end of 1912. John (Jack) Edwards Burgess was transferred to Mudgee in 1912. He served in the CBC for 47 years. Jack Burgess' son J (Jasbo) Reg Burgess was born in Mudgee in 1913 (real name Reg, known as Jasbo). He joined at Warren branch in 1930, and later served at 11 NSW country branches including Mandurama and Parkes before his appointment as Accountant Moruya. After the death of his wife he was appointed to the relief staff and says he worked at more than 124 branches in NSW before his retirement on 8th July 1974 after 45 years service. "My retirement has completed a total of 115 years CBC service for our family My father J E Burgess had 47 years, I had 45 years, my son J T Burgess is Manager of Griffith branch with 17 years and my daughter Lesley was in the CBC for 6 years before her marriage". From Current Accounts 01/1975. Reg Burgess' son J. Terry Burgess worked at branches including Delegate, Condobolin and as Manager Griffith in July 1974 and Armidale. In August 2005 Terry sent photos for www.CBCBank.com.au to use in compiling the list of branches on the website. He is involved in the week long Rotary Bowel Screening Programme. Reg's daughter Lesley Burgess was in the CBC for 6 years before her marriage.